All cells in a multi-cellular organism undergo growth and death. Cellular death is essential for an organism to grow and survive. Human body is made up of innumerable types of cells in different parts of the body. There are mainly two ways in which a cell undergoes death, either through exposure to harmful environment, injury or through a pre-planned and regulated process of disintegration. Cell death occurs via two different processes- one being necrosis and other being apoptosis. Necrosis is a process of cellular death which occurs when cells are exposed to extreme conditions which are very different from normal living conditions. This leads to damage to the internal cellular environment and rapid cell and tissue damage. So the basic inability of the cell to maintain balance when exposed to rough conditions leads to complete discord in the cell’s functioning and eventually its death. Apoptosis is a pre-planned, regular process of cell death occurring in the body where the cell itself actively takes part in its own death. It occurs as a part of normal cellular multiplication and turnover. So cells die naturally to maintain a balance of the cellular multiplication. Apoptosis is required for smooth functioning of the body. most cells in the body have a shelf-life, for example, red blood cells live for 120 days, at the end they are destroyed in the body. This is a method of apoptosis. Necrosis is a pathological process which is detrimental to the body. It occurs when the cells are exposed to toxins, or on exposure to extreme conditions which could be anything from increased temperature, decreased oxygen levels etc. These conditions lead to damage to the wall or membrane of the cell. An inability to maintain normal functioning in these conditions leads to an imbalance in the internal environment of the cell. This leads to inflammation and tissue damage which leads to accumulation of cellular debris. Apoptosis is a normal, natural process which is necessary for the body as it maintains a balance in the number of cells in the body. If cells do not die on time it can lead to a tumour or cancer formation which is an accumulation of unwanted cells. If cells die too fast, it can lead to conditions such as AIDS, heart disease and liver disease. So if apoptosis does not take place as it should, there will be signs of disease. In necrosis, there is loss of integrity of the wall of the cell which leads to swelling of the cell’s contents as well as disintegration of small bodies of the cell. In apoptosis, there is no disintegration of the cell membrane (wall) rather there is shrinkage of cellular contents along with clumping of the membrane. This leads to formation of condensed bodies known as apoptotic bodies. These bodies are recognised by the immune system of the body and destroyed efficiently by the immune cells. Thus, it is a well coordinated process due to which there is no accompanying inflammatory reaction. Necrosis is a passive process which does not require energy and can occur at any point of time. This is a random event which is unregulated. Apoptosis is an active process which requires energy and occurs in an organised manner. Many enzymes and agents are required to carry out various steps of this process. Apoptosis and necrosis are variants of cell death that vary greatly in all ways except the end result. Necrosis is a type of cell death wherein the cell dies an untimely death due to uncontrolled external factors and apoptosis is a predefined cell suicide wherein the cell actively destroys itself to maintain smooth functioning of the body. Apoptosis is a natural physiological process which is required by the body while necrosis is a pathological process which stems from inflammation and tissue damage. rachita. 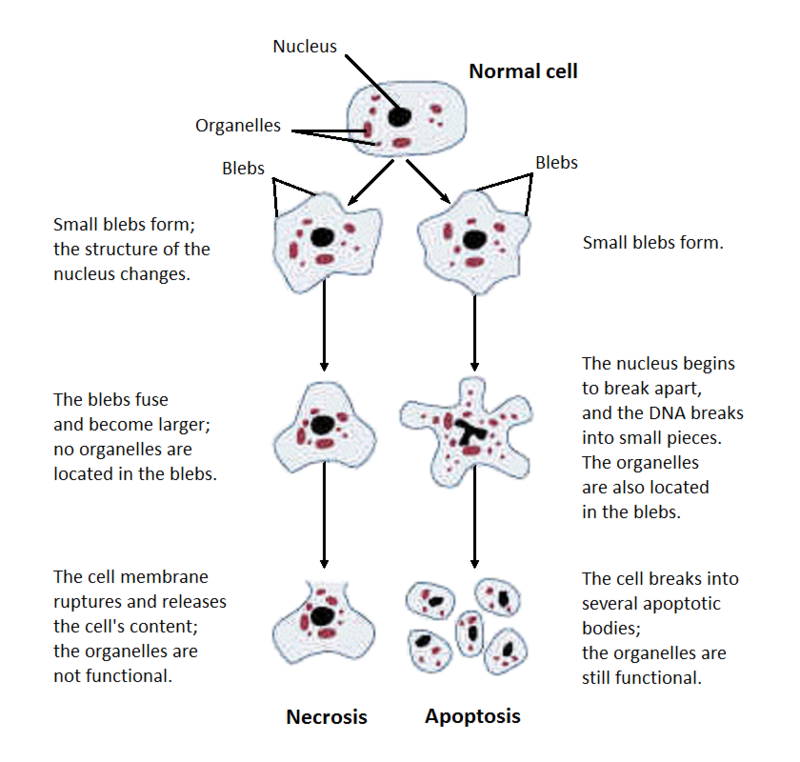 "Difference Between Necrosis and Apoptosis." DifferenceBetween.net. June 5, 2018 < http://www.differencebetween.net/science/health/disease-health/difference-between-necrosis-and-apoptosis/ >.